If you've read your Arizona history, you know that long before the pioneers of Phoenix, like Jack Swilling, and John Y.T. Smith, arrived, Arizona had been a battlefield. It was a place of war between Indian tribes, and they were bitter enemies. And if you've never read about that, it's not surprising. It's horrible. And although it's part of Arizona history, it really doesn't do to dwell on it too much nowadays. The war ended a long time ago, and those who had been enemies became enemies no longer. I collect old photos of Phoenix and post them on a Google+ page, and everything I see makes me want to learn more. 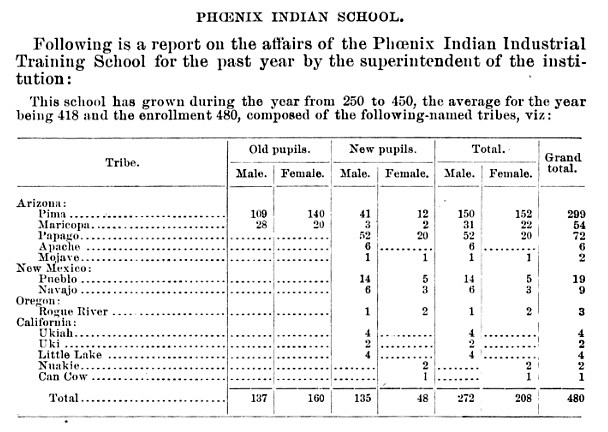 Last year, with encouragement from my Indian friends, I started posting, and writing, about the Phoenix Indian School. Because, even though there are a lot of photos of it, and even though there is a major street in Phoenix by that name, no one seems to talk about it. And those who do tend to just display ignorance, which saddens me. 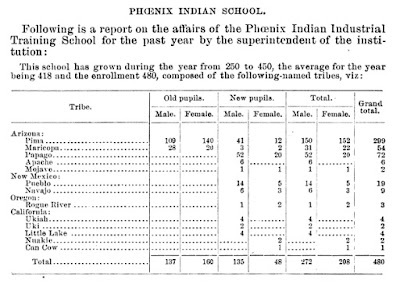 Take a look at the 1898 Phoenix Indian School report above. Take a real good look. Nothing surprising, right? Now travel back in time to when this was printed. The school had been established only seven years earlier for the Pimas. And now enrollment was expanding to include the Apaches. The elders must have wished for a day when hatred and bloodshed would end, and enemies would be forgotten. That Pima and Apache children could play together, be brothers and sisters. It must have seemed like a wild dream at the time, but it came true, and is true today.